If you've been watching the news recently, you've probably heard them talking about ISIS. The media would have you believe that ISIS is located solely in the Middle East, but we at Building Rubble are here to set the story straight. The terrorist group is slowing taking over the world, one industry at a time. Here are five of the things that ISIS has already taken over that prove that mainstream media is keeping us in the dark and that we are not safe even in our own homes. 1. Television - Most Americans spend a decent portion of their lives plopped in front of the tv with the remote in one hand and a conglomeration of snacks in the other. ISIS is smart enough to realize this and has decided to hit us right in the cable boxes. By making themselves seem like the "good guys" by posing as a fictional spy agency in the television show Archer, ISIS has not only infiltrated our homes, but they were welcomed in with open arms. 2. Medicine - ISIS has opened a pharmaceuticals company with the oh-so creative name, ISIS Pharmaceuticals. Why they have taken to selling medicines designed to help people is anyone's guess. It would seem that a terrorist organization would be more likely to let people suffer through their illnesses rather than help to cure them. 3. Roadways in Australia - WHY?! 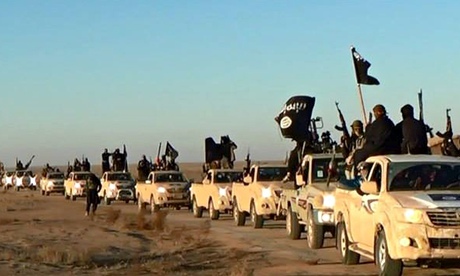 Why would ISIS ever need the Isis Highway in Australia? No one has been able to figure this one out yet. Maybe they are planning to use the highway to transfer supplies, but with the entirety of ISIS's membership being based in Syria it doesn't seem likely. 4. Space - Yes, there's a satellite named ISIS. Yes, it is said to be for studying the ionosphere. However, does ISIS really expect us to believe that their satellite is not being used for surveillance of the United States? C'mon Isis, we're smarter than that. 5. Undersea life - Coral. They have their own genus of coral. Granted, it is soft coral which seems like the opposite of the hardened image they are trying to portray, but still: it's coral.